By looking at the strings of every individual file, it seems they all share the same code base. Most of the files are Droppers of Droppers and at the end there are almost always different .dll files (x86/x64). It also showed that the earliest sample is from 2011 and the latest is from 2013. The files (or better some strings, e.g. suspicious API function names) are partly encrypted and the malware samples make use of the Microsoft CryptoAPI. I also found some files from additional malware packages (see Parts section below), so there exist more samples that I will provide in this article. 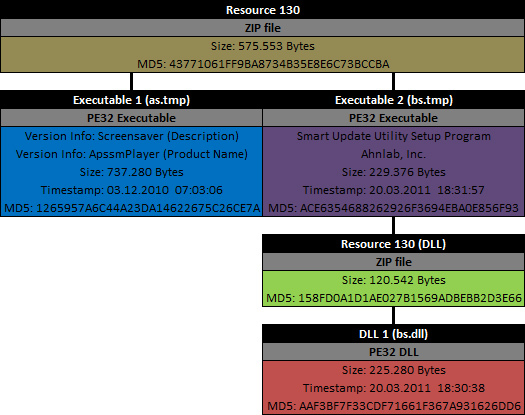 In my overview the samples of each tool are chronologically arranged (from PE Timestamp which looks valid). First I present information about the initial Dropper followed by an picture which shows the various files inside the Dropper. 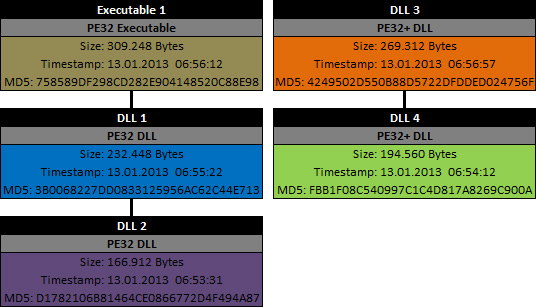 The individual files are marked with different colors if they have different MD5 hashes, otherwise they have the same color. So let's start to enumerate all the samples..
That's it! Have fun reversing!